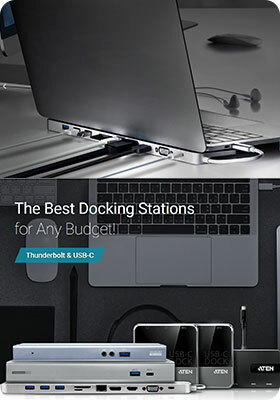 ATEN docking stations connect all the devices you have ever wanted to transform your everyday USB-C* or Thunderbolt™ 3* laptop into a more advanced desktop computer - in an instant. There's no need to carry or reconnect multiple cables every time you return to your desk, which means you can spend more time working or playing and less time concerned with setup. ATEN docking stations provide up to 10 peripheral ports - USB-C, Gigabit LAN, DisplayPort with Multi-Stream Transport, HDMI, VGA, audio and USB 3.1 Gen 1 ports - through a single USB-C cable. The USB 3.1 ports are ideal for high speed data transfers and quickly charging portable devices. ATEN docking stations support single display up to 5K resolutions via DisplayPort or HDMI and dual monitors in mirror and extended mode at resolutions up to 1080p. ATEN docking stations route video from a source computer to a DisplayPort or HDMI or VGA monitor via single cable while maintaining the highest quality resolution. ATEN docking stations also support USB-C Power Delivery 2.0, which provides power to matched USB-C laptops with PD profile specifications of 20V/3A, 20V/1.8A, 12V/3A, and 5V/3A.